NASA's newest lunar probe is officially orbiting the moon. After a month-long journey, the Lunar Atmosphere and Dust Environment Explorer (LADEE) spacecraft — designed to probe the moon's thin atmosphere and lunar dust — performed an engine burn on Sunday (Oct. 6) that took it into orbit around the moon. Before arriving in lunar orbit, the LADEE spacecraft (the name is pronounced "laddie") made three elliptical orbits around the Earth, moving into a higher orbit on each pass around the planet. Once its orbit was high enough, the moon's gravity took over and LADEE performed its big burn to transfer to lunar orbit, mission managers have said. LADEE now needs to perform two more lunar orbit insertion maneuvers before the probe's approximately month-long checkout phase can begin. The probe's next burn is scheduled for Oct. 9 and the third is scheduled for Oct. 12, which will lower it to an altitude of 155 miles (250 kilometers). During the checkout period, scientists will test out LADEE's laser-communications demonstration. The experiment used laser technology to send large amounts of data back to Earth. The laser communication model could allow spacecraft to send 3D information, high-definition video and other data back to ground controllers, scientists have said. 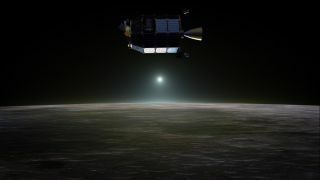 Once LADEE's commissioning phase is finished, the probe will begin 100 days of science designed to probe the mysteries of the moon's atmosphere and a moon dust mystery dating back to the Apollo program. Apollo astronauts saw streamers of light on the horizon before sunrise on the moon. LADEE's instrumentation will help scientists understand what could have caused the glow. NASA officials wrote in a facts sheet: "Was lunar dust, electrically charged by solar ultraviolet light, responsible for the pre-sunrise horizon glow that the Apollo astronauts saw?" LADEE will also investigate the moon's extremely thin atmosphere. Called a surface boundary exosphere, the lunar atmosphere represents the most common kind of atmosphere in the solar system. Some planets (like Mercury), moons and even certain large asteroids play host to these kinds of atmospheres, making LADEE's research wide reaching. "It's a class of atmosphere we actually don't know that much about, so it turns out that the moon actually is a really convenient place to go and learn about this very common type of atmosphere," Sarah Noble, LADEE program scientist, said before the probe's Sept. 6 launch. LADEE launched to space atop the first flight of the Minotaur V rocket from NASA's Wallops Flight Facility on Wallops Island, Va.